I took a different challenge this year than I have done in previous years. In past challenges, I have written on a different blog, one I set up for personal posts, posts that weren't inherently related to education. This year, I pushed myself to stay on the blog I share, the one that is reserved for education-related topics. It's been hard. 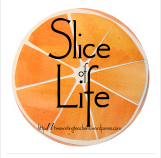 While there've been slice-worthy moments I've come across throughout the days, relating the slices to teaching and learning hasn't been easy, and honestly, hasn't always led to my best writing. Sometimes has even led to some bad or boring writing. I'm reflecting, and I'm thinking, and I'm pretty sure that if someone said, "Melanie, write a snippet of family life, and don't worry if it's for no other reason than for capturing a moment," I'd feel so liberated that I'd work hard to write a good one. And here's my connection to teaching and learning (because I'm staying with my personal challenge): What if every once in a while--maybe once a week or once every two weeks--during a unit, there was a built in free-write day? A day to just blab, be silly, and take a writer's stretch, escaping the restrictions of a genre or a goal or a checklist or a chart. Write what you feel like writing and share it if you choose. Just offer up a couple of mid-unit breaks. Has anyone explicitly tried this? I'd love to hear about it if you have. It is like you are here with us!!! Tammy and I are together writing this week. I did choose to post on our shared blog but did not commit to always connect it to school (like I usually do). I did some, but not all. My reflection after this month is that we need to build in more time for choice, more time flexibility with structure, more independent studies.... I am thinking a lot about how to use writer's notebooks differently after this challenge. I wonder if a twitter chat --lessons learned from a month of slicing.... would be helpful. I know it would help me - I would love to think more about what we all learned AND how to bring it back to the classroom. Thank you for being part of our conversation. We adopted the TCRWP writing Units of Study this year. It has been great, but it is intense! We give the kids a free write Friday at least every other week and they eat it up. I love your thinking- I think we all need that free choice aspect, even if it is is the middle of something else. I do this at the end of every writing unit - free writing time, your choice time, have fun time. My kids (and I) really love it. My students in the past were always working on some goal or other that connected to their personal topic research, but the writer's notebook was theirs, to do with what they wished, and we had sharing from whomever wished to every Friday. I did read the notebooks & commented, but also lifted lines I thought wonderful & posted them on a chart every week, author unknown. I kept track to be sure everyone was included often, but saw eyes light up when their words were posted. Children bring such joy to their work when they get to choose. Great idea, Melanie. My students have been blogging all year long. They grab at those free choice days. Choice is important to growth, I believe, in both reading and writing.